You can improve your looks, comfort, and health with just one treatment. 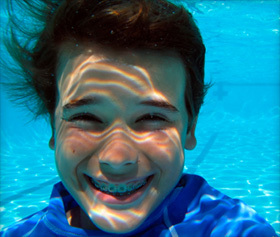 Braces are a great way to invest in your smile for a healthier and happier future. Our dentist in Kelowna, also serving West Kelowna, provides high-quality metal braces to correct any kind of orthodontic imperfection. Patients considering braces for teeth may want to learn more about the features of metal braces. Brackets are metal or ceramic metal pieces that are attached to each tooth. The archwire is a thin metal wire that runs through each bracket. This wire puts pressure on the teeth that gently moves them into their ideal positions. The elastic ligatures hold the archwire to the brackets. You can customize the color of your elastics to suit your personal style. Dr. Malfair helps his patients achieve a comfortable braces experience. He will give you the instructions and advice you need to achieve results quickly with minimal discomfort. Orthodontics give you straight teeth that are better protected from tooth decay. Misaligned or crooked teeth are linked to the buildup of food and decay. They’re difficult to floss and brush properly. Straight teeth don’t provide hiding places for dangerous bacteria. After you improve your smile with metal braces, you’ll feel more motivated than ever to take care of your beautiful teeth. You can also avoid irregular bite patterns and jaw joint pain by wearing orthodontics. When you achieve straight teeth with dental braces, you won’t be as susceptible to jaw pain or tooth injury. Braces for teeth will have a significant impact on your self-esteem. Some patients find themselves embarrassed due to crooked teeth. Orthodontics can permanently change your teeth to give you a smile full of confidence. 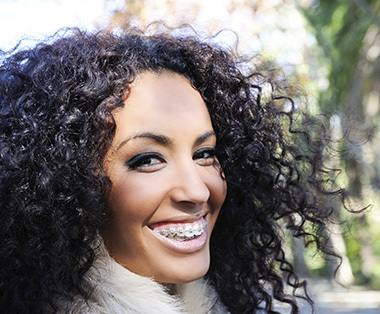 Metal braces allow patients to live fulfilling social, personal, and professional lives. Schedule your orthodontics consultation with our Kelowna dentist today. Give us a call today! Also serving West Kelowna. We look forward to working with you! Come and meet the team and see if this is the dental office for you! & we will contact you to arrange a date and time and answer any questions you may have. Kelowna dentist Dr. Stephen Malfair and his team at Choose Your Smile provide exceptional cosmetic dentistry, dental implants, general dentistry and so much more to their patients. They even offer sedation dentistry for patients who would like to be relaxed during their dental visit. We serve patients from Kelowna, BC including South Kelowna, East Kelowna and West Kelowna, British Columbia and postal codes V1Y 8B7 and V1W 3C6.